The stacked housing design allows the use of floating backup rings, for sealing extreme pressures in side port swivels. We have devised an improved arrangement for implementing Kalsi-brand rotary shaft seals in high pressure side port swivels. The swivel design is based on our simple stacking plate method of incorporating our patented floating backup rings. These metal backup rings allow the use of the smallest practicable extrusion gap clearance without risk of heavily loaded metal-to-metal contact. The backup rings self-align on the mandrel, and float laterally to follow mandrel runout. 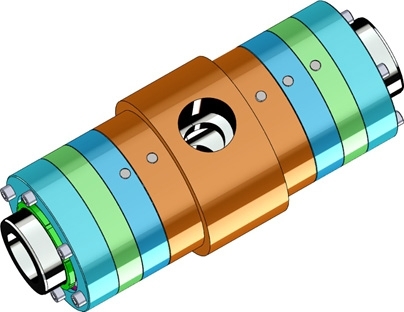 The minuscule extrusion gap clearance that is provided by this arrangement allows the rotary seals to achieve their maximum high pressure performance potential. In a 1,000 hour, 7,500 psi test of 2.75” (69.85mm) Plastic Lined Kalsi Seals at 255 ft/minute with floating backup rings, the seals survived with very little damage. 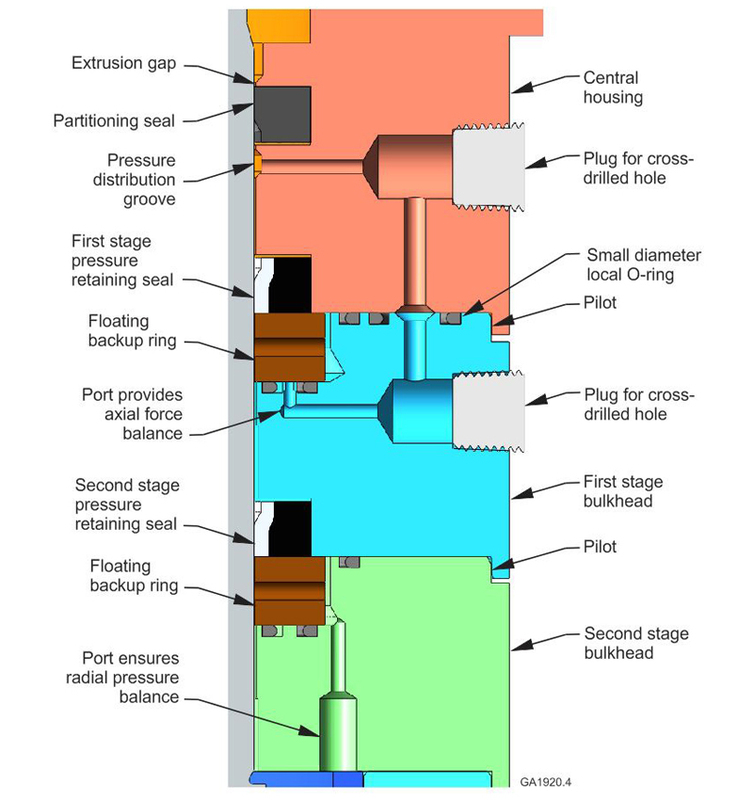 Pressure staging allows even higher flow pressures to be addressed. The expandable images below show the construction details of a high pressure side port swivel with two pressure stages. Detailed swivel design recommendations are provided in our shaft seal handbook. The image on the left shows one-half of the swivel, and overall construction details. 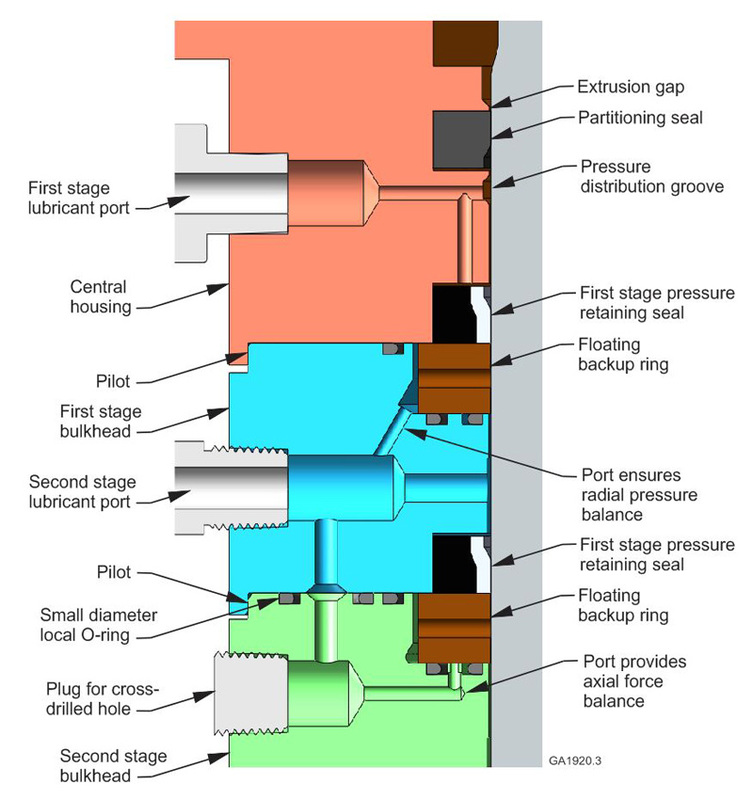 The partitioning seal separates the first stage seal lubricant from the process fluid that is flowing though the swivel. The floating backup rings are captured in place by the first and second stage bulkhead housings. The bulkhead housings are bolted to the central housing, and the bearing housing is bolted to the second stage bulkhead housing. The bearings can be sealed and lubricated if desired. Notably, the bearing housings are isolated from the pressure induced expansion of the central housing and the first stage bulkhead housing. The assembly is based on parts that are relatively easy to machine, and avoids all use of radial O-rings, which increase assembly difficulty and are failure prone in high pressure conditions. The middle image is an enlarged view that shows the ports for the seal lubricant, and some of the internal lubricant passages of the swivel. The first stage lubricant pressure is slightly higher than the pressure of the process fluid, in order to keep the partitioning seal properly oriented for optimum abrasion resistance. The second stage lubricant pressure is half that of the first stage lubricant pressure, so that total pressure is divided between the first and second stage pressure retaining seals. The middle image also shows the cross-drilled holes that provide pressure to the backside of the second stage floating backup ring, providing axial force balance. Ports in the first stage bulkhead and the first stage backup ring assure that the first stage backup ring is radially pressure balanced, for maximum dimensional stability. The right-hand image is an enlarged view that shows more of the internal construction of the swivel. 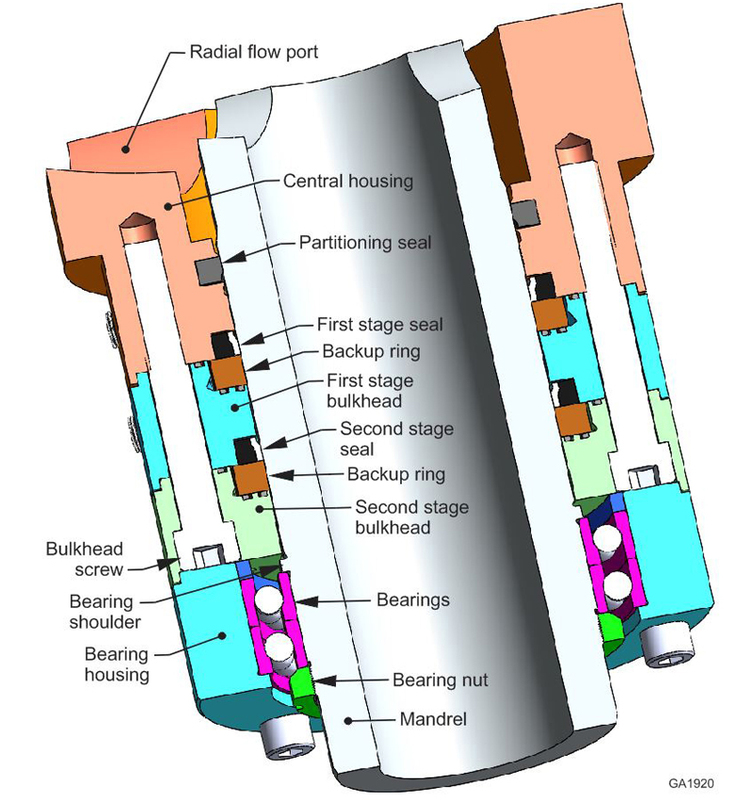 The image illustrates the cross-drilled holes that provide pressure to the backside of the first stage floating backup ring. The axially short pilots between housings provide excellent alignment with no risk of binding during assembly. Ports in the second stage bulkhead and second stage backup ring assure that the second stage backup ring is radially pressure balanced. Anti-rotation pins are incorporated at a different angular location, not shown here, to prevent rotation of the backup rings. Clearance between the backup rings and their respective bulkhead housings allow the backup rings to align on the mandrel, following any dynamic runout of the mandrel that may be present.